Each morning, my alarm goes off at 7 a.m. but sometimes I lay in bed for a bit longer. No reason to rush. No one is in much of a hurry here at the tip of Mexico’s most western territory, the Baja Peninsula. I like to start my day by taking a mile-long walk around the gated community my husband, Dan, and I live in. The houses are mostly three-bedroom and almost all provide a spectacular view of the famous arch in the Sea of Cortez. Throughout my walk I catch glimpses of the mountains and the sea. My husband and I had been visiting Cabo San Lucas for six years before we moved here. Every visit we fell more and more in love with the people, the culture, the mountains, the ocean, and of course, the tacos. By our fourth year of visits we realized it was not just the vacation getaway we loved, but that Mexico was meant to be our new home. Being at the tip of the Baja Peninsula, Cabo is a desert mountain surrounded by the Pacific Ocean on one side and the Sea of Cortez on the other. Cabo San Lucas is an interesting blend of dichotomies. It is a desert surrounded by water…a quaint, remote fishing village surrounded by million-dollar modern homes…it’s in Mexico but is seemingly equally inhabited by Canadians and Americans. Many people live here year-round but it is also a popular snowbird and tourist destination. Downtown Cabo is hugged by three distinct beaches. 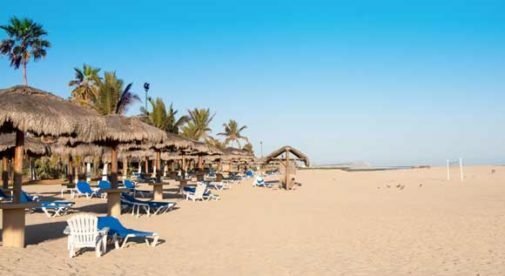 At the mouth of the marina is Medano Beach, lined with resorts, restaurants, bars, and vendors, and is the destination for many tourists and cruise ship guests. Across the Sea of Cortez Bay is Playa Grande, a favorite of the locals for snorkeling. It’s fairly deserted during the week but comes to life on Sundays with families cooling off and relaxing. And the beach on the Pacific side is great for a walk, but is not swimmable due to the undertow. Moving to a new country is pretty adventurous and we wanted to make the transition as easy as possible. Fortunately, we know a friend with a vacation house in Cabo and worked out a deal to watch his house in return for living there. But housing is easy to come by in this area and there is a little bit of everything available for every taste and budget. If you are looking to be in the heart of the action, you can find reasonable condos downtown with easy access to the marina, Medano Beach, fine dining, and Cabo’s nightlife. A two-bedroom, two-bathroom condo, just steps from the marina, is for sale here for $225,000. With 1,800 square feet of living space it has a marina view from the deck, a parking space, and is ideally located. Living here, you could take a morning stroll around the marina while watching the fishermen head out for a day’s work and end your evening with a nightcap at the famous Cabo Wabo Cantino. For a more relaxed setting, drive 15 minutes out of town to the El Tezal neighborhood. Here you’ll find condos and single-family homes lining the mountainside, many with amazing 180-degree views of the Sea of Cortez and the Land’s End Arch. A two-bedroom condo in this neighborhood is currently on the market for $145,000. Both bedrooms have balconies with sea views, there are granite countertops and state of the art appliances in the kitchen, and it comes fully furnished. There’s also 24-hour security and access to a shared swimming pool. Every day is pretty much the same weather-wise and I can’t say I miss the Chicago winters. Cabo San Lucas has four seasons but they are similar and there is never more than a 10 F to 15 F difference in day and night temperatures. The summers are hot—too hot for some—but I love it. Spring and fall are perfect with temperatures in the 75 F to 85 F range during the day. Winters are freezing cold…highs of 70 F and lows never lower than 55 F.
We are spoiled with the weather. Our first year here, my husband and I would joke when the day was ruined because there was a solitary cloud in the sky. We love the adventure of living in Cabo. Every day is an opportunity to learn about a new holiday, a new unique cultural idiosyncrasy, and of course the food. For us, the blending of cultures, environments, and activities Cabo offers, is truly a paradise. When I awaken each morning to the sounds of the Caribbean surf rolling onto the sugary beach only yards away, and watch the pelicans and gulls plucking their breakfast from the waves, I realize my good fortune to live where I do on Mexico's Riviera Maya.